I completely agree with my colleague Tasha Robinson when, in a Conversation here on The Dissolve, she says that Gravity is a film “where the 3-D and the biggest screen possible are critical, to the point where people who watch it at home in 2-D will be seeing an entirely different movie.” She is absolutely right. I saw Gravity earlier this week in IMAX 3-D and it was a startlingly powerful experience; so powerful it’s hard to even imagine watching it in 2-D on a laptop or, God forbid, an iPhone. Director Alfonso Cuarón has been quite vocal in his criticism of most 3-D movies (“They are crap,” he said last month, among other things), and with Gravity he put his money where his mouth is: The 3-D in Gravity is more than cool; it’s visceral. In its best moments, the effect makes us feel like we’re floating right behind Sandra Bullock as she dodges space debris or navigates a fiery space station. I’ve seen other movies where the 3-D was very effective—it brought an extra layer of fun to Jackass 3-D and contributed to the sense of hallucinogenic disorientation in Universal Soldier: Day Of Reckoning—but this was probably the first where it felt essential. 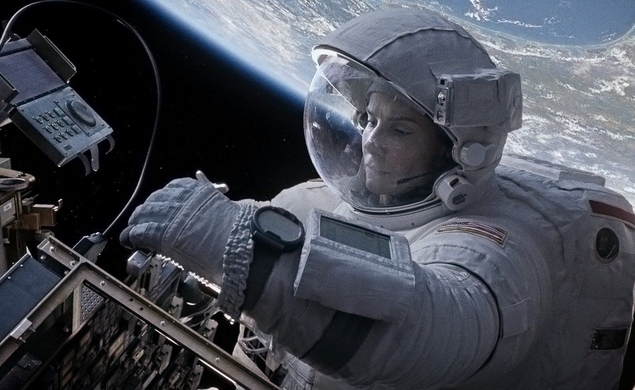 I suspect that Gravity’s 3-D looks about as good as is possible with current filmmaking technology. But even at the very pinnacle (or at least a significant plateau) of the format’s artistic achievement, even in a movie from a director who spent years working to maximize its strengths, there are still problems. And unlike other common 3-D issues—image darkness or unconvincing depth effects—these can’t be smoothed over with a little extra care or money, because they exist within the audience, rather than the film. I’m talking specifically about the flimsiness of the 3-D effect, and the way it tends to warp or vanish completely when viewers tilts or move their head. In order for current 3-D to work, moviegoers need to keep their eyes perfectly still and level at all times; as anyone who’s ever tried to stretch their neck or check their watch at a 3-D movie will tell you, the moment you shift in your seat, the 3-D goes blurry. If, like me, you’re a fidgety person, this is a serious and frequent problem—as distracting to the illusion of immersion as a ringing cell phone or a taking patron. This is a particular issue in Gravity because Cuarón loves to work with the entire frame; often he’ll place a character in one corner in the foreground and put an important piece of visual information (a key spaceship or a person floating in the distance) in the opposite corner in the background. It’s a great way to express the vastness of space, but it’s tough, particularly on that giant IMAX screen, to take it all in without moving your head. So it’s a constant fight between your eyes and your body to physically adjust without actually physically adjusting. It can get very frustrating. The only current cure for this problem may be worse than the disease: HFR, or high frame rate, projects a film image at 48 frames per second, twice the normal rate. HFR premièred with Peter Jackson’s first adaptation of The Hobbit and it was widely reviled for making an expensive movie look like a cheap TV show. (Our own Tasha Robinson said she “hated it”—emphasis hers—when she reviewed the movie for The A.V. Club.) And while I would agree that HFR had some major issues, it did have one significant upside: It made The Hobbit’s 3-D seamless. You could fidget, twist, bend, or get out of your seat and wander the theater (which I may have done at one point to test this out), and the 3-D held firm. But, again, HFR comes with its own set of problems; it makes the 3-D more believable at the expense of the costumes, sets, and makeup. This is particularly disheartening because Cuarón and Jackson aren’t carnival barkers looking to exploit a gimmick for extra bucks; they’re artists doing their very best to use 3-D in an creative way. These are some of the finest visual directors of our time and even they can’t solve 3-D. And if they can’t, I genuinely worry no one can.